Ardlorn Ferry is located on the west coast of Scotland. There is a small single platform terminus which serves the car ferry, distillery and Elkin's fish smokery. The time is late 1950s / very early 1960s, when steam was just giving way to diesel, but this area was the last haunt of Caley 0-4-4Ts, 'Jumbos' and other old Scottish steam locomotives. These are seen at Ardlorn Ferry, but any suitable Scottish locomotive may appear. 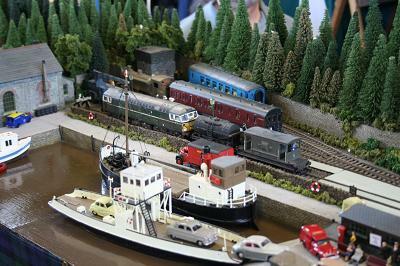 The rolling stock features mainly kit-built examples, many built by Aidan Houlders or Peter Whyborn, and the latter built the ferry and some of the road vehicles too. Some of the buildings are those recovered from the original Ardlorn layout which sadly succumbed to a flood a few years ago. Nothing runs on Ardlorn Ferry straight from the box, and every attempt is made to match the correct locomotives to location and period. The same is true of the rest of the rolling stock, with plenty of kit-built coaches, freight stock and service vehicles on display. 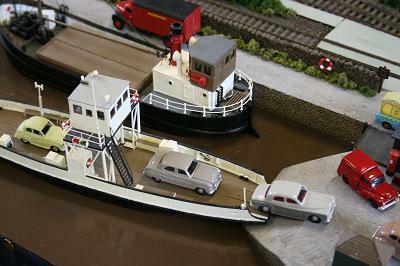 Of special interest are the boats and road vehicles, many of which are also kit-built. Ashton Depot is a medium size diesel depot, with stabling sidings behind the locomotive shed. It is set in the Midlands and shows a representation of the types of locomotives that I saw as a lad in the late 1970s and early 1980s, growing up in the Leicester area. Most of the locomotives are from the Corporate Blue era leading into the Large Logo era and finally into the Railfreight era. There are also some engineers' wagons making an appearance, being stabled for a while, and vans delivering spares and other items for the Depot. 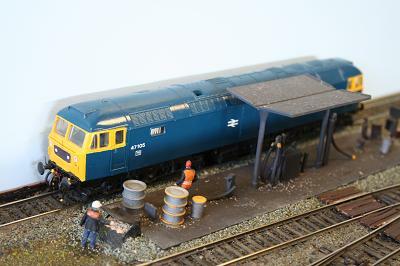 There is a refuelling point and you will see the odd DMU appearing to be refuelled. Bad Cardhu is a small town in the area of Aachen in Germany. The tiny bahnhof only sees a handful of passenger trains in a day and these are interspersed with a small amount of freight. The freight is normally beer trains, which originate at the brewery at the rear of the station, and to the saw mill at the other end of the layout under the road bridge. Built in 1995 as a Scottish branch line, the decision was taken to convert it to German and to use the excellent Fleischmann stock and to operate it digitally. The wagons were fitted with MBM magnetic couplings, which are activated by permanent magnets positioned at strategic places between the rails. 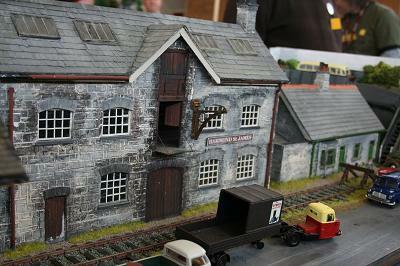 The brewery was scratch-built, the saw mill a second-hand Walthers kit ready built, and the station a slightly cut-down Faller kit. The whole layout measures only 4'6" x 1'9" adn is controlled using a Fleischmann LokBoss controller. The points are worked by Seep point motors and are the original ones fitted. The backdrop was made utilising some pictures taken on holiday in Germany and painted using acrylics. Bembridge was the easternmost station on the Isle of Wight, located some 2.75 miles north-east of Brading Junction. The line opened in 1882 and was closed in 1953 due to declining traffic. In the 1920s, with the introduction of the Adams 02 class tanks, the sector plate was increased in size from 16'5" to 25' to accommodate the longer wheelbase engines. In 1935 the Southern Railway decided to make the line one train working so there was no need for signals. The signal box is effectively a ground frame and was operated by the fireman to allow the engine to run round its train. The line was mainly operated with the Beyer Peacock 2-4-0T, Terriers and the later 02s; this also included a push-pull operation. During any quiet period of the day, the duty engine would leave its train at Brading or Bembridge and perform shunting duties at St Helens Quay. Coal wagons would also be propelled from St Helens to the coal siding. The long siding was used to store rolling stock when no other space was available locally. The setting is the Pacific Northwest where the redwood is king. 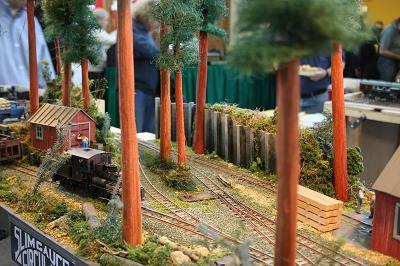 The scene depicts the backwoods engine facility for the Marten's Pine logging operation. 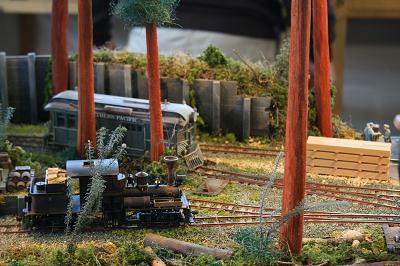 The layout features Shay and Climax type locomotives from Bachmann and scratch-built freight cars based on the Mich-Cat Logging lines. 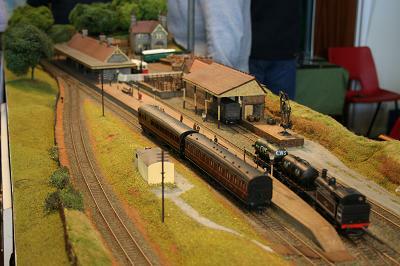 All structures on the layout are scratch-built from strip timber. East Street Wharf is a setting somewhere in the Midlands in late GWR / early BR days. There is an interchange shed for general goods. On the other side of the basin, coal and steel is unloaded. Road transport is on the increase as the wharf is taken over by other industrial users. Trackwork is SMP, points and hand-built and controlled by rod and slider switches. Magnets under the track operate Sprat & Winkle couplings. Rolling stock is kit built or modified 'ready-to-run'. Buildings and scenics are scratch or part kit built. 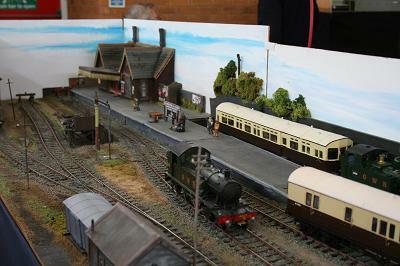 The layout is now controlled by DCC. 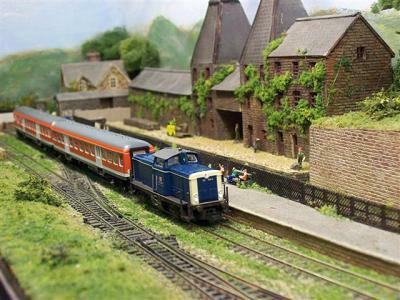 Featured in the December 2006 issue of British Railway Modelling. 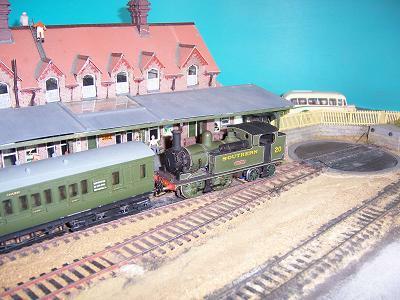 Eastbridge shed depicts a small but important depot situated at a busy junction in southern England. 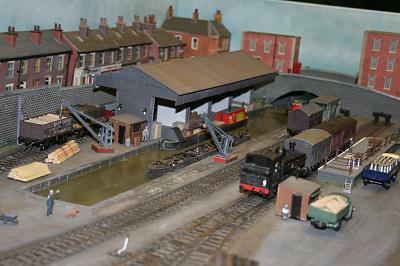 The layout is partly based on Redhill. The shed has three roads, as at Redhill, the other trackwork being adapted to fit in the space available. 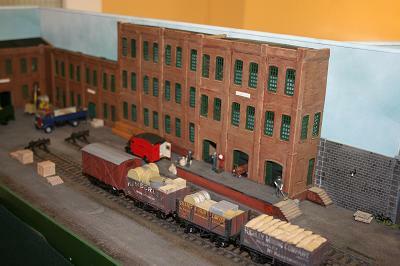 The main building is constructed of styrene sheet covered with brick paper and weathered with an airbrush. The roof is a typical Southern type found on various sheds throughout the southeast. Inspection pits are provided within the shed at Eastbridge and in the yard outside, as well as on the ash and coaling roads. The coaling stage is not an exact copy of the one at Redhill, the original being covered in asbestos sheeting, on Eastbridge it is brick. 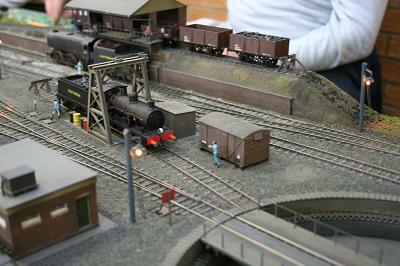 The turntable is of the open pit type, scratch-built mainly of styrene sheet. The drive unit comprises a small motor and gearbox, driving a rubber wheel that presses onto one end of the turntable. Eastbridge from time to time receives engines from other parts of the country, but Southern locomotives predominate. 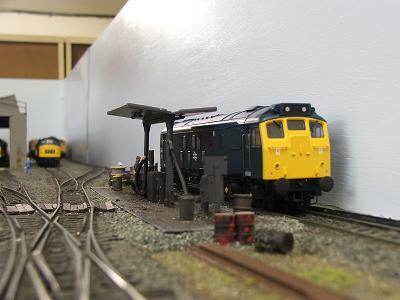 Locomotives arrive on shed, are coaled, watered and turned if required, the stabled to await their next turn of duty. 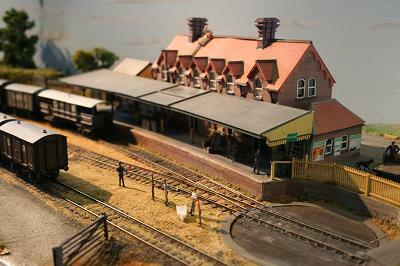 It can become quite hectic in the fiddle yard supplying and receiving locomotives to and from the shed! Featured in the December 1998 issue of British Railway Modelling. Hammond St James has been mainly recycled from an former layout called Tipton Green. The baseboards are constructed from recycled wood which was once part of a Hammond organ in the church of St James, hence the name of the layout. 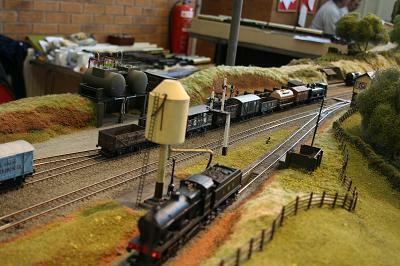 This is a fictitious station based on a country terminus with a goods yard. The timescale is 1950/60s, and favours GWR working practices. 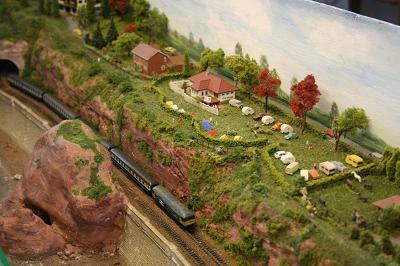 After purchasing three Z-gauge class 47 locomotives and a considerable amount of rolling stock, I decided to build a small diarama based on the famous Dawlish sea wall. When asked where it was, I said nowhere in particular, but it was loosely based on Dawlish, to which the enquirer replied 'Loosely Warren' (Dawlish Warren). 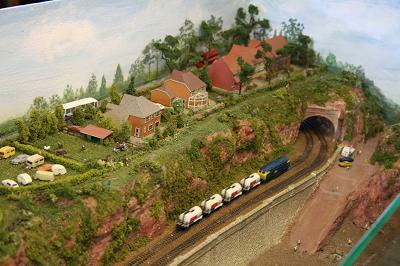 The track (Märklin) was laid and the sea wall (S D Mouldings, N gauge) was put in place. The red cliffs, so characteristic of the area, were made from polystyrene and plaster. Since the opening of the Channel Tunnel, I have used modellers' licence and visiting locomotives and rolling stock from the continent often make guest appearances. 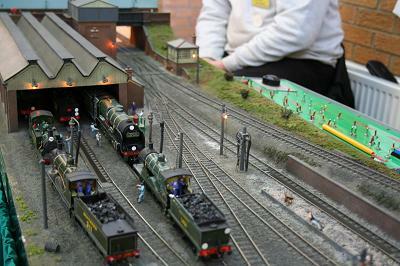 The layout is powered by two standard Märklin controllers. Oakley is an imaginary location set in Shropshire in the valley of the East Onny river. It is served by branch lines from Craven Arms (LMS) and Montgomery (GWR), hence trains from both companies. The stock is proprietary, some of which has been modified or detailed to suit the 1930s period. 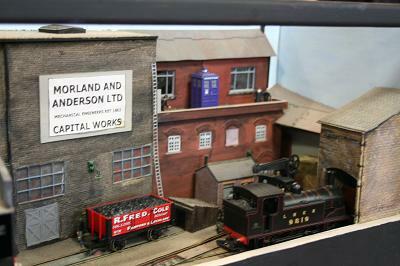 The buildings are mainly scratch-built or substantially modified kits. The layout is controlled from a central console with mimic diagram, route setting and interlocked operating signals. The operating programme is far more intensive than a small terminus would have in reality. The intention is to keep both the public and the operators interested by always keeping the trains moving.